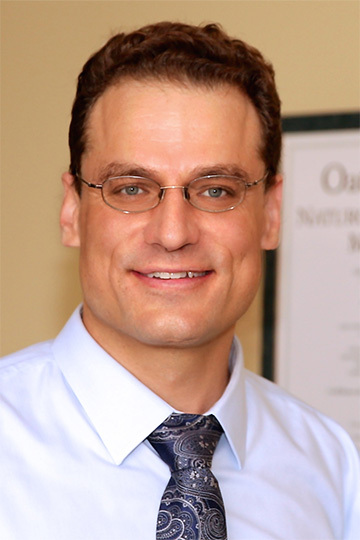 Andrew Litchy, N.D. is a Naturopathic physician. He received his Doctorate in Naturopathic Medicine (ND) from the oldest Naturopathic Medical School in the United States, the National College of Natural Medicine (NCNM) in Portland, OR. While attending NCNM, Dr. Litchy also received a Certificate in Shiatsu massage. During his education, Dr. Litchy worked with superb physicians completing training in treatment of acute and chronic disease, as well as mentorships in Cardiology, Oncology, chronic Lyme, and chronic fatigue syndrome. Dr. Litchy also conducted research studying the effects of meditation training on the body and mind and has presented this work at national and international meetings. Prior to attending NCNM he received the Bachelor of Arts degree in Physiology from the University of Minnesota (Twin Cities). Dr. Litchy is graduate faculty at the University of Minnesota, Adjunct Faculty at the National College of Natural Medicine and is a past Treasurer for the Minnesota Association of Naturopathic Physicians (MNANP). In addition to his Naturopathic medical education, Dr. Litchy is a meditation instructor and mind/body practitioner. Since reading his first meditation book at age 14, he has trained with several Buddhist meditation teachers and was an ordained Buddhist monk. For the past eleven years, Dr. Litchy has been studying with Sayadaw Gyi U Vimalaramsi Maha Thera and is an endorsed instructor of Samatha-Vipassana meditation. Dr. Litchy is privileged to have been mentored by skilled body workers. His primary mentors are Margie Fargnoli RMT, teacher of Body-Mind centering, and Phyllecia Rommel, Senior Instructor of Ortho-bionomy. In addition, he has worked with Jim Cleaver, LAc learning Shiatsu and Tao Yin, and also with Rosetta Coach, LMT, ND learning soft tissue and energetic techniques. Dr. Litchy is a family practice naturopathic physician. He sees patients of all ages and with a variety of chronic and acute concerns. He utilizes a variety of modalities selected for ones individual situation. Dr. Litchy enjoys working with other physicians and healers, and is happy to coordinate care. Dr. Litchy has been engaged in healthcare for much of his life. He completed two internships at the Mayo Clinic’s Biomechanics laboratory. He was an Emergency Room Technician at Regions Level One trauma center in St. Paul for four years, and spent one year providing direct care to developmentally disabled and autistic individuals prior to his naturopathic training. These experiences greatly shaped Dr. Litchy’s approach to health; he strives to incorporate and utilize modern medical science with effective natural treatments while never forgetting the individuality of his patients. Care with Dr. Litchy starts with addressing your current concerns. He will help you understand the nature of your illness, and then offer treatments and training that can empower you and bring you to true wellness. It is his purpose as a physician to strengthen and support you and to help you make the transition from healing to healer, from suffering to joy. This is possible! When not in the clinic, Dr. Litchy enjoys spending time with his wife and son. He is a musician and composer, and has performed in several venues in the past. Now, he can be found with his son on his knee, both plunking away at the piano. He is an avid gardener and cook, and is owned by two lovely cats. Dr. Litchy is wonderful. Need I say more? I will anyway. I appreciate his dedication to treating the whole person not just symptoms. He treats health not disease which is a rare find in health care these days. And he’s a super nice guy. Representative to the House of Delegates for the American Association of Naturopathic Physicians. Four years as an Emergency Room Technician at Regions Level One Trauma Center. Two Internships at the Mayo Clinic’s Biomechanics laboratory in Rochester, MN. Research: designed and conducted multiple research studies examining the effects of meditation training and bodywork on heart rate variability, autonomic nervous system balance, and stress. Meditation: volunteer meditation instructor at Pathways Health Crisis Resource Center, Minneapolis public schools community education program, and Minneapolis Loving-kindness meditation group. Naturopathic Medicine is medical practice based on the philosophy that each individual human body possesses the unique and innate ability to heal itself naturally. Neighborhood Naturopathic uses holistic and natural medicine, proven treatments and alternative therapies to help your body heal.